It is really hard to manage a perfect wedding—even a long preparation will never assure its certainty. That is why important occasions such as this should always be regarded and invested. For couples, they should make sure that their wedding will be thoroughly prepared. 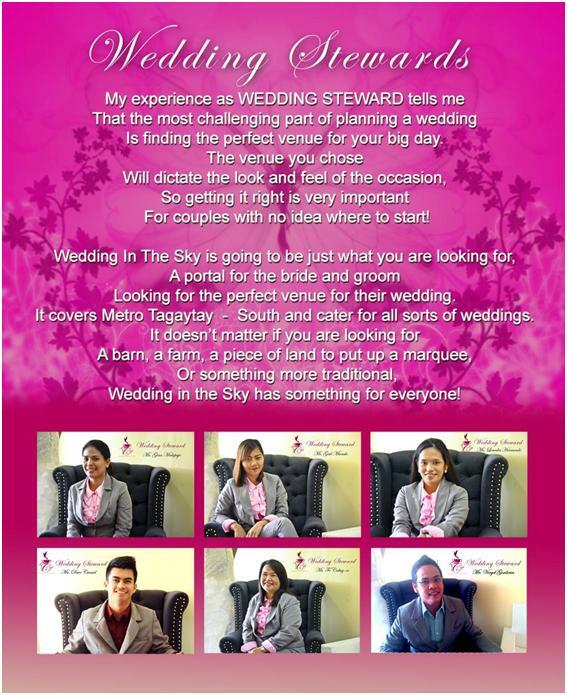 That’s why The Wedding Store gives you the most approachable professionals—Tagaytay Wedding Stewards. With thorough knowledge and training in giving the best wedding ideas and packages, stewards would help you achieve the wedding you’ve been dreaming. As the only entitled Wedding Stewards, we offer committed assistance for every concern your dream wedding has. With years of experience there is much that we can give —we don’t let our clients wander but help them get through the most crucial decisions they face in achieving their dream wedding by showing them different packages available. Ms. Maria Lourdes Hernando, one of the wedding stewards told that to establish good relationship with their clients is a must in order to know personally the ideas they wanted for their wedding. Time is never wasted in dealing with us, but we do not also rush in attaining good and ideal wedding the couples wanted. Another steward, Ms. Cristal Gail Manalo added that as stewards, we don’t oversell. We are honest with what we offer and give just packages. And the best thing about dealing with us is that we recommend different local suppliers that fit the budget and the idea of the clients. We are not just concerned of what we have, but we also have concern with what you want. "Priority ", that’s how Ms. Camille dela Cruz, another steward described her treatment to her clients. She said that when she's with her clients, she feels the pressure, as if she's the bride. We have gone beyond work and just glad to satisfy our clients the best possible way. With positivity and friendly approach, we were able to gain friends through this work. Most customers go back to us and express their appreciation with our hard work. And the years of countless effort helped us gain credibility and trust from our beloved patrons. Ms. Gina Malapajo, with 4 years of experience in being a wedding steward said that she learned how to ride on with the clients and handles stress at the same time. We want personal connection that is why we get our clients' ideas first, and then we go step by step process till we get there. Other stewards are Ms. Fe Cabug-os, Mr. VergelCordovin and Mr. Claren David Canuel. They all have the best offering for you. Being a steward doesn't just have a commitment but a friend that gives the best way and ideas to have the best celebration of your love. From the wedding venue to the packages that will suit your budget and style—we will handle it as you want them to. Stewards long to ease your relentless preparation. We know the right venue for the kind of motif you want—from the highlands of Tagaytay, the scenic view of Taal Lake to the different pavilions in the area. We won’t compromise the things that you want. Considering the distance from the church to the reception, the kind of weather in your wedding day. We will take care of it. Your concern is our concern as well—so you should no longer worry about your wedding because our aim is to achieve the wedding you want.